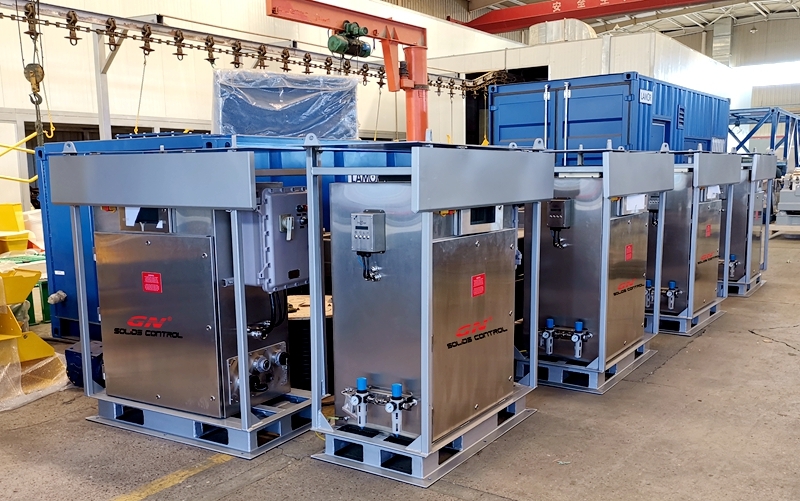 Recently 1 set of oil sludge treatment plant is almost ready for shipment to Asia client, it is under testing in our facility before shipment. The treating capacity for oil sludge separation is 5 m3/h. We also have standard or customized designed oil sludge separation system with 1 m3/h and 15m3/h for option. GN sludge vacuum pump transfer the oil sludge from the waste pit/pond to the pre-mixing modular, the pre-mixing tank equipped with heating lines which can heat the oil sludge to increase the flowability of the oil sludge and increase the separation efficiency of the shale shaker, decanter centrifuge. By adding the chemicals, it will also increase the efficiency of the further process steps. 2 mud agitator and one submersible slurry pump are installed on the pre-mixing tank with electric control system. Then the pre-treatment oil sludge is transferred to the shale shaker to separate the coarse solids by the submersible slurry pump, it also reduces the solids content of the oil sludge so that the centrifuge could separate the fine solids easily. The shaker screen is specially made with big opening to separate coarse solids to protect the decanter centrifuge. The screw pump feed the oil sludge to the decanter centrifuge, the discharged fluids is flow to the 3 phase centrifuge to separate the oil and water. The clean water and pure oil is flow to the buffer tank , which will be pumped to the oil storage tank and water storage tank. The water can be used for the circulation again. 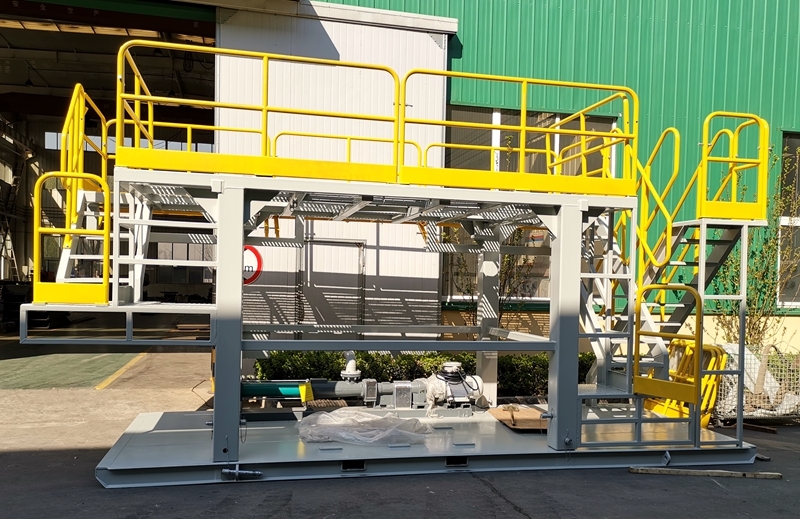 The 20ft container loading dewatering unit will be used when necessary with decanter centrifuge, the chemical jetting is to make the oil mixture easily separated by the decanter centrifuge. If you need a customized solution for waste oil sludge treatment, pls contact with GN sales for more information. Recently GN solids control shipped 10 units of VFD decanter centrifuges to Middle east with IEC explosion proof motor and VFD control panel, these are high configuration decanter centrifuge, which can be widely used for dewatering unit, drilling fluids treatment, drilling cuttings treatment, waste water treatment, oil sludge separation system and all other kinds of liquids and solids separation. The decanter centrifuge package including screw pump, telescopic skid, decanter centrifuge and VFD control panel, all in one skid for convenient transportation and operation. 1) Positive pressurized VFD control panel with PLC smart control, with self cooling system and HMI interface, 3 motors VFD for main motor, back drive motor and feeding pump motor. 2) The motor and control panel is IEC EX certified for zone 1 application, suitable for operation temperature -20-55℃, especially suitable for Middle East area. 3) The inverter is ABB brand, and all the electrical components are option for ABB/ Scheneider/ Siemens. 4) The VFD control cabinet is made of stainless steel material for longer working life and better corrosion resistance. 5) The cable gland, power supply pin and aviation plug are all IEC EX certified. 1) Bowl material is made of duplex stainless steel 2304 or SS2205, the other parts of bowl is made of SS316, the collection box is also made of stainless steel 304 for better corrosion resistance. 2) The screw is made of stainless steel material and heating treatment up to 1000 degree, the opening screw propeller increase the treating efficiency. 4) The screw protection is tungsten carbide tiles and repairable, the solids discharge port and fluids distribution port are all protected by tungsten carbide alloy and it is interchangeable. For more information, pls contact with GN solids control. GN solids control just come back from CIPPE 2019 oil exhibition in Beijing, China. 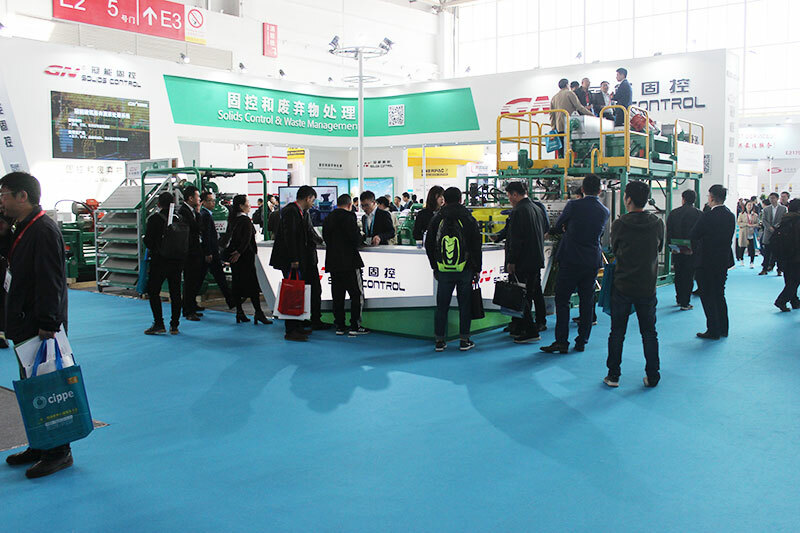 We showed our advanced technology and equipments at the CIPPE oil show. Below is the photos taken in our stand. 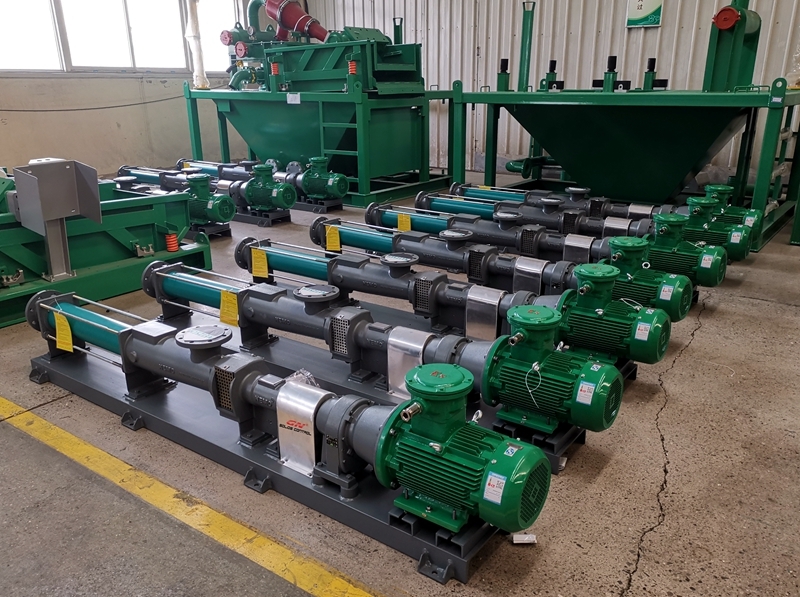 1) Sludge Vacuum pump: it is the ideal pump to transfer the waste cuttings, waste sludge, oil sludge, drilling mud, cement, powder material and other industrial waste. 2) High G force drying shaker with 4 panel composite material shaker screens. The screen dimension 585x1165mm, we can install the shaker screen with API mesh size from API 20 to API 325 comply with API RP13C. The G force is up to 8.0G. 4) 22 inch bowl decanter centrifuge for waste water treatment and waste sludge treatment and dewatering unit, the bowl diameter is 550mm, the bowl length is 2310mm, different with the normal drilling fluids treatment centrifuge, the GNLW554 series centrifuge can treat the discharged water much cleaner, it is ideal centrifuge for the project required very clear water. 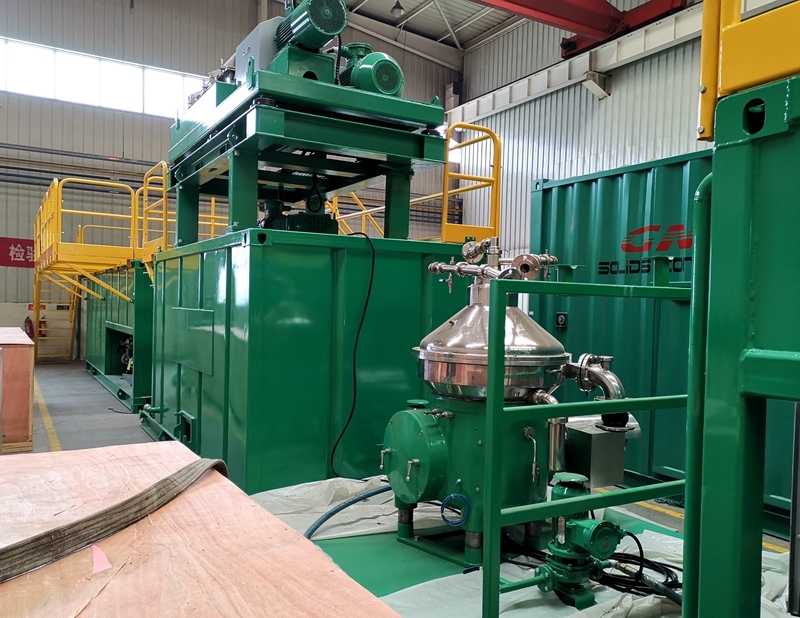 The Premixing tank, coarse solids separation shale shaker, decanter centrifuge, three phase centrifuge, chemical dosing unit, fluids buffer tank, shaker fluids collection tank, oil tank, water tank and complete skid. The mud agitator and heating lines installed on the premixing tank. 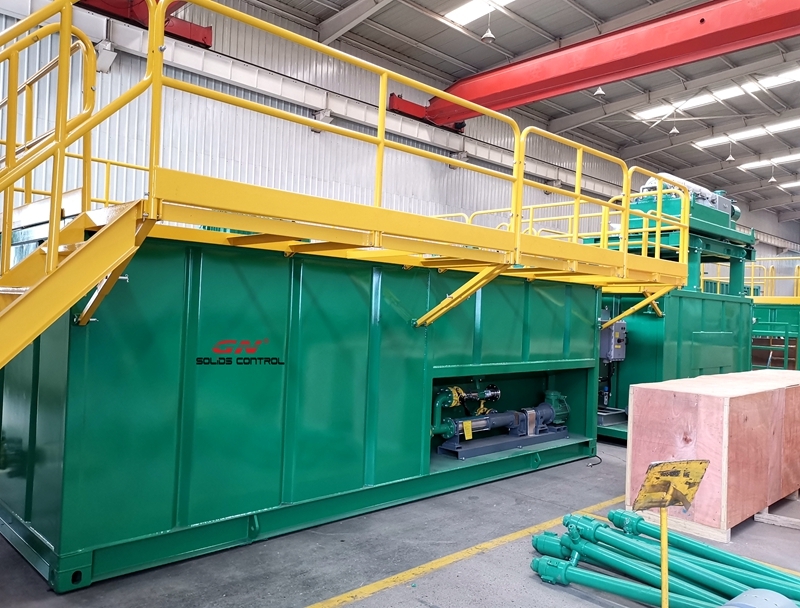 6) Vertical cuttings dryer for oil based drilling cuttings treatment. 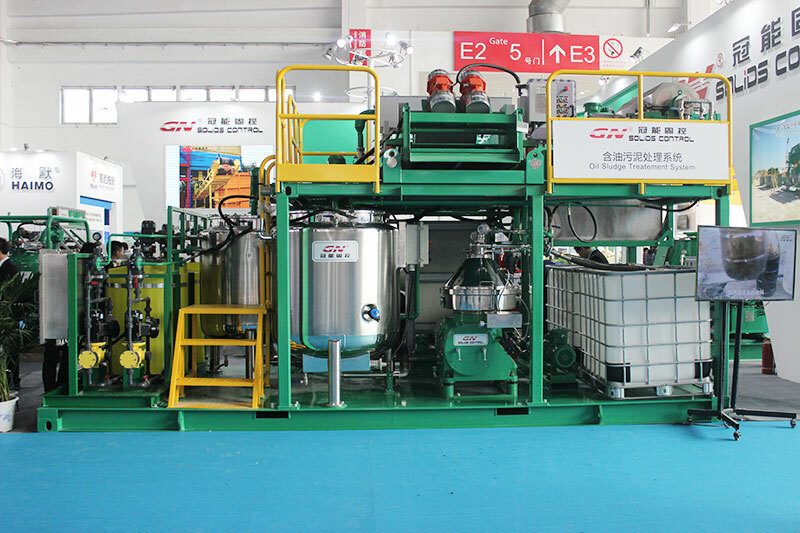 We got a lot of inquiries and positive interests for the oil sludge treatment unit. The working video for the oil sludge treatment is as below: By using proper chemicals, we can design the customized system for different requirement. If you need to know more information, pls get the brochure from our sales engineer. 1) 2 single deck shale shaker installed on one tandem skid, with possem belly. 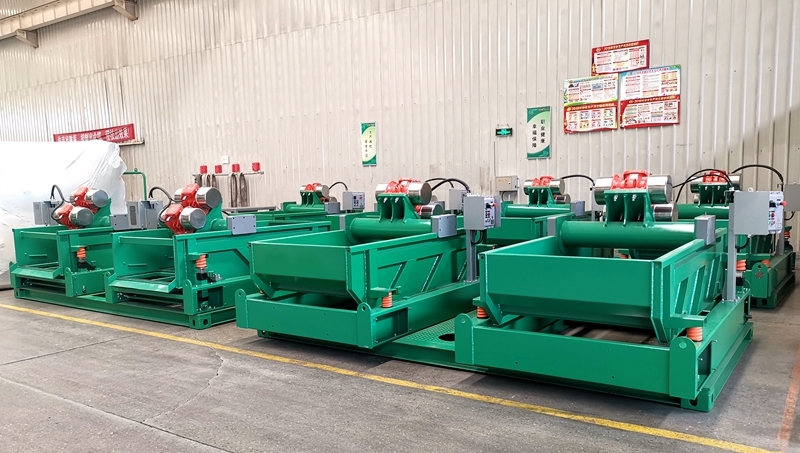 When loading in the container, the single shale shaker will be packed by wooden pallet separately, the skid will be fixed by special made frame, the possem belly will be protected by plastic flim and disassembly to fit to the container size. 2) The 2 tandem shale shaker treating capacity is up to 1200gpm for drilling fluids of both WBM & OBM & SOBM. We can provide the shaker screens with API NO. from API 20 to API 325 as per clients’ requirement. The shaker screens are composite material frame shaker screens for longer working life and larger screen area. Each single shale shaker is equipped with 3pcs shaker screens for free. 3) The shaker deck bottom is made of stainless steel 304 for better corrosion resistance of the fluids touch part. 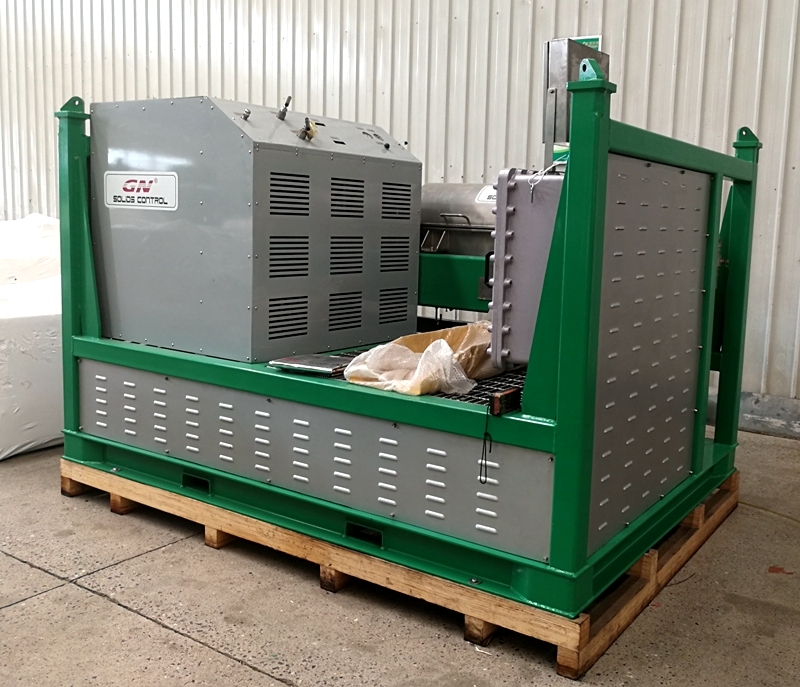 The shaker skid is made of high grade structure steel. The screens are locking by the wedges for fast replacement of the shaker screens, the user do not waste much time to replace the shaker screens, and the screens working life is average 300 hours, it reduces the times to replace the screens. 4) The compact design is for convenient transportation from one rigsite to another. 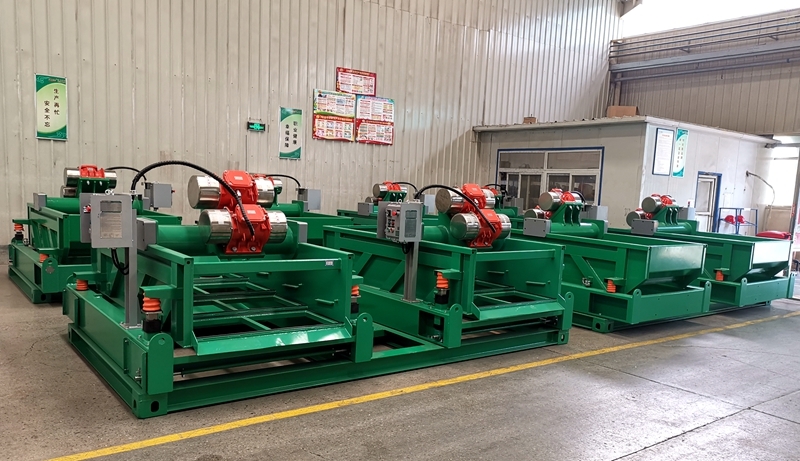 We can also produce the triple shale shakers as per the client’s requirement, to install 3 units of linear motion shale shaker on one oilfield skid. The explosion proof vibration motor and starter could be CNEX, ATEX OR IEC EX for option as per the different requirement. If you require shale shaker, mud cleaner, decanter centrifuge, vacuum degasser, pls contact with GN solids control, we can also produce customized tandem shale shaker. 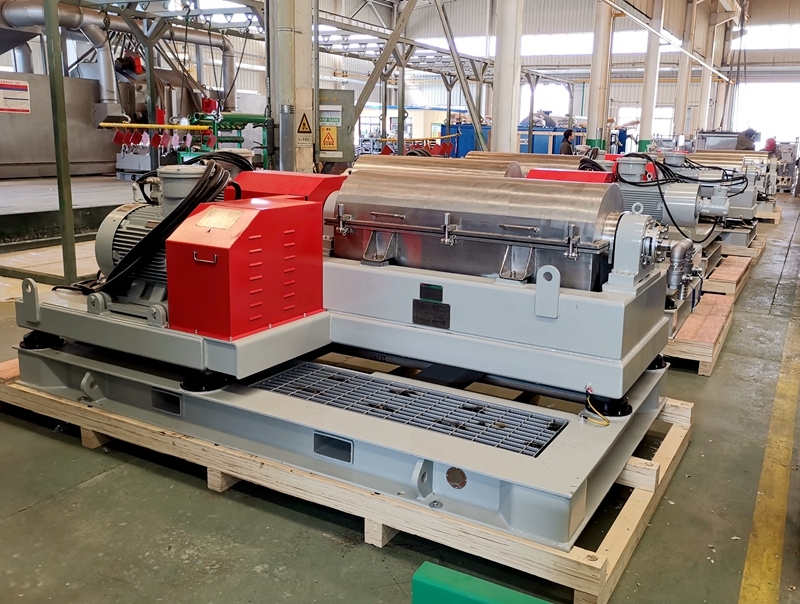 As the reliable manufacturer of hydraulic drive decanter centrifuge in China, GN solids control recently shipped several units of Full Hydraulic Drive decanter centrifuge with feeding pump to Middle East, together with over 80 units of centrifugal pumps. 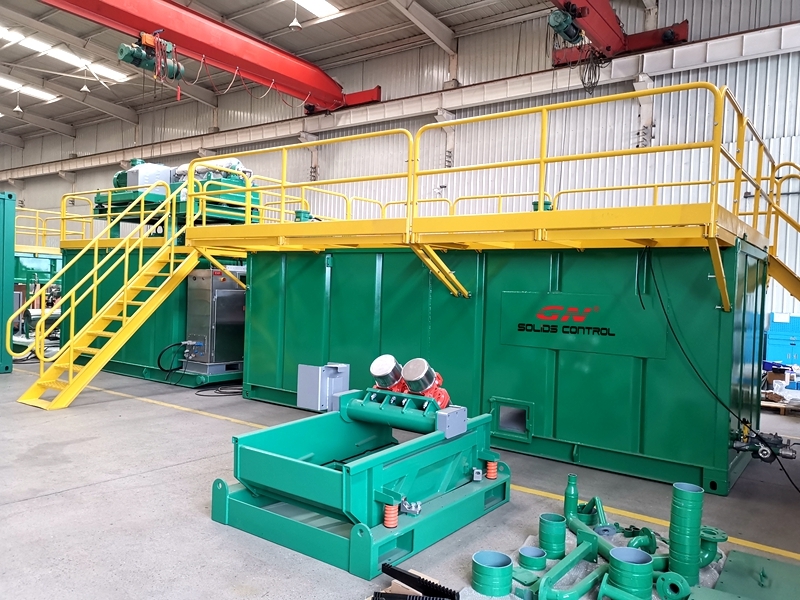 When we start production in the second factory in Dachang Chaobai River Development area, we introduced one batch of advanced machine to produce decanter centrifuge and vertical cuttings dryer, also for the centrifugal pump. We have high speed balancing machine, low speed balancing machine for balancing of centrifuge bowl. We can produce decanter centrifuge with 9 inch bowl, 14 inch bowl, 18 inch bowl, 22 inch bowl, 30 inch bowl for option, we have fixed speed centrifuge and VFD decanter centrifuge for different applications, also when used in high temperature weather area, for heavy drilling fluids, the user will need full hydraulic drive decanter centrifuge, compared with VFD decanter centrifuge, the hydraulic drive centrifuge is much easier to adjust the differential speed to reach better performance of the centrifuge treatment. 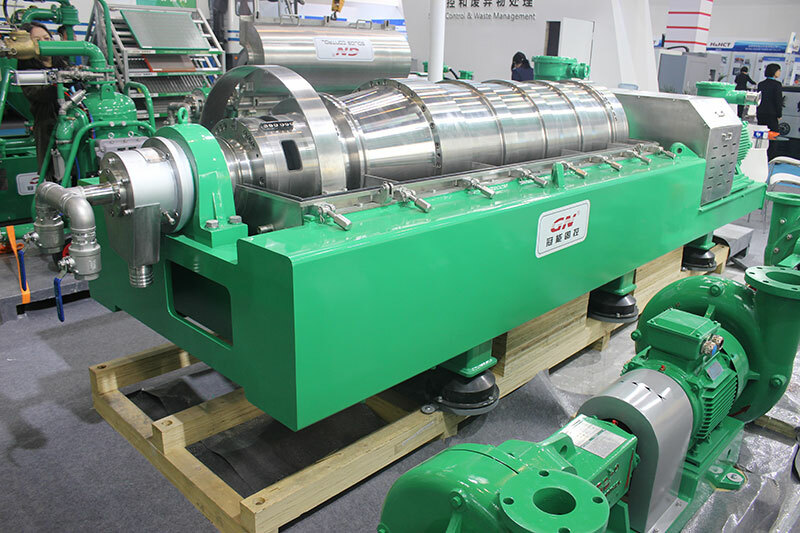 The feeding pump of the decanter centrifuge is positive displacement pump made by Germany Netzsch, it works steadily to feed the drilling fluids to the decanter centrifuge, the speed of the pump motor could be adjusted by PLC smart system so that the feeding flow rate will be controlled according to the client’s requirement. 4. The centrifugal pumps are widely used to transfer the drilling fluids, waste sludge, dredging slurry, oil sludge, etc. different materials and industry waste water. The major wear parts of the centrifugal pump is pump casing, impeller, the material of impeller and pump casing made by GN solids control is hard ductile iron alloy for longer working life and better wear resistance. For more information about the full hydraulic drive decanter centrifuge, pls contact with GN solids sales.